The Rural Studio in Alabama has for the past 20 years contributed to the provision of new buildings for the community around Greensboro. 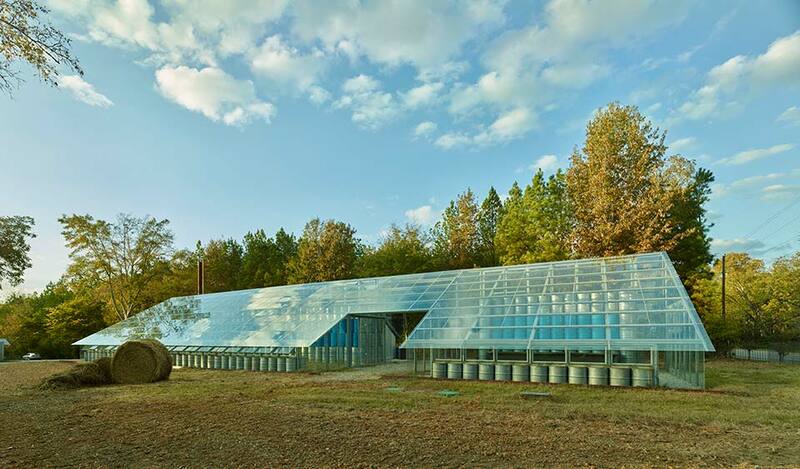 The buildings are designed and constructed by the students and staff of Auburn University’s architectural faculty using materials donated in part by local manufacturers. This glass house uses recycled barrels as the primary support structure with a sloping roof of laminated glass panels structurally bonded to the steel framing roof members. The new greenhouse will offer the opportunity of growing crops of tomatoes cucumbers and other plants not normally grown in the local climate. The crops will be used by the resident students and staff and excess produce will be distributed to the local community.